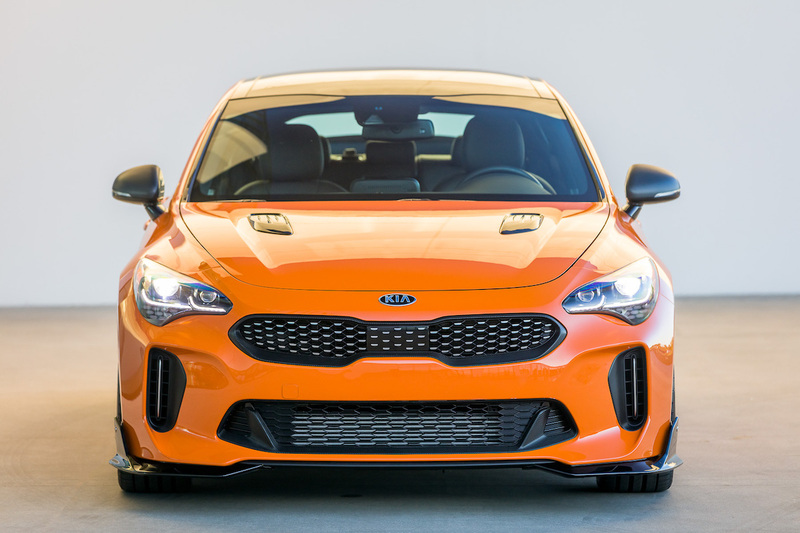 Fittingly for something revealed on October 31st, Kia brought something big and orange, with more cutouts than a hastily carved pumpkin, to SEMA 2017. Was it more trick than treat, though? In previous years at SEMA, Kia has brought along novel creations like the craft ale-dispensing Sedona in 2014, or a chop-top Optima in 2015. However, as the brand pushes the development of overtly sporting products, Kia is using the 2017 SEMA show to go big on aftermarket performance. We’re already a fan on the Stinger GT, so turning up the heat with a range of bolt-on parts seems good. The fact it’s been painted in a custom orange colour scheme is only going to help win us over, too. However, the Stinger GT Federation has a serious reason for a name that sounds like it belongs in Star Wars, not on the highway. 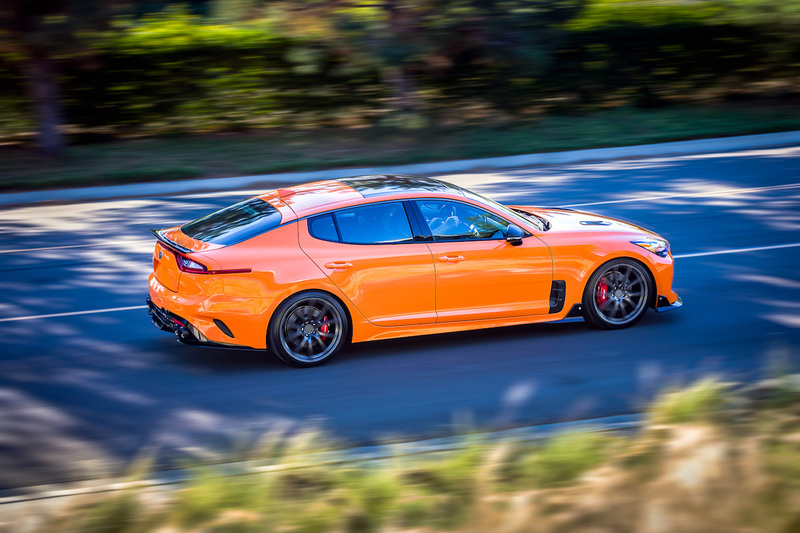 The Stinger GT Federation marks the start of Kia offering aftermarket parts and accessories for production models. In reality, the Stinger GT Federation should have a Fast & Furious-style ‘wishlist’ on the front doors, such is the array of companies that have contributed bits. Air Design USA has created the rear spoiler, diffuser, and bonnet vents, whilst TSW have supplied the 20-inch alloy wheels wearing staggered Falken rubber. 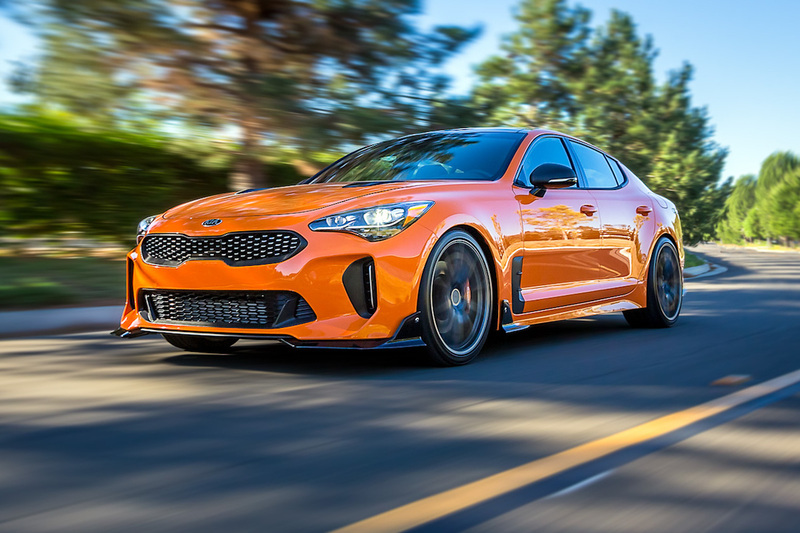 Eibach suspension drops the Stinger GT lower to the ground, Borla adds a performance exhaust with carbon fibre tips, and K&N air intakes help the 3.3-litre turbo V6 breathe easier. Peak power has increased to 380hp. 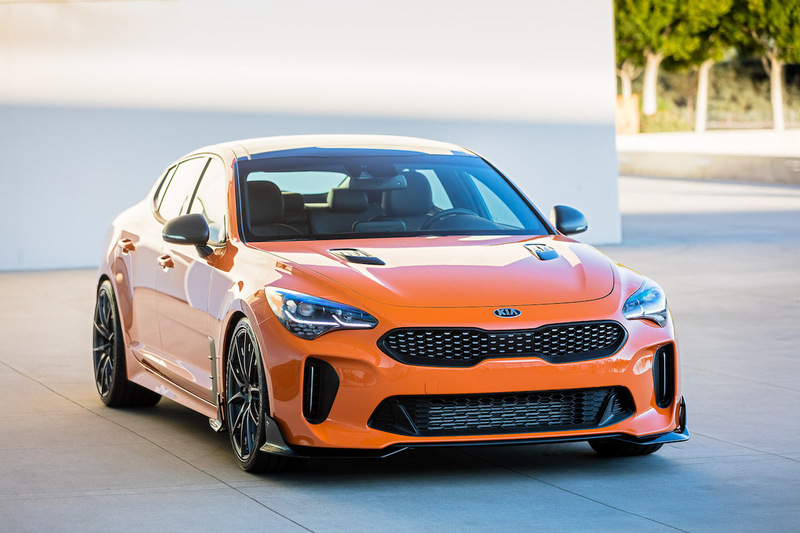 In many ways it sounds almost exactly like Kia has taken the Stinger GT back in time to the early 2000s, and dunked it head first into Max Power and Pimp My Ride modifying culture. In fact, that almost exactly what Kia has done with the two other cars on show in Las Vegas. Number two is another Stinger GT, but this one has been modified especially by West Coast Customs. Yes, the very company featured in first fours series of MTV’s Pimp My Ride. No, Mr ‘X to the Z’ Xzibit wasn’t on hand to unveil it, but West Coast Customs have still done an impressive job of stretching out the Stinger GT with a full wide body kit. WCC have also lowered the suspension, and bolted on a set of 21-inch rims. No word on whether there’s a boot-mounted terrarium full of scorpions, so you can have stingers in your Stinger (sorry – Ed). The Kia Cadenza Obsidian. We don’t know if ‘Mad Mike’ installed the subwoofer, sorry. 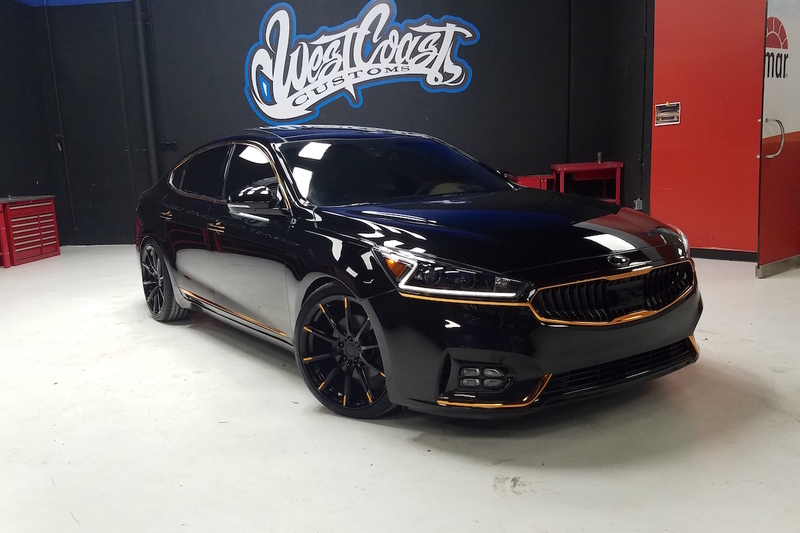 The other work of West Coast Customs is the sizeable Cadenza saloon. As Kia’s full-size luxury offering, the special Cadenza Obsidian has received a slightly subtler makeover. Wearing metallic black paint with copper accents, 20-inch black wheels and ceramic black window tints keeps things relatively on the down low. Inside brown leather – described as “butter soft” by Kia – covers the seats, with the 630-watt Harmon Kardon sound system gaining an integrated subwoofer.